A journey on the water! Rennes-le-Château and Rennes-les-Bains are both in the department of Aude and they are both not far from this great river, 224 kilometres long. 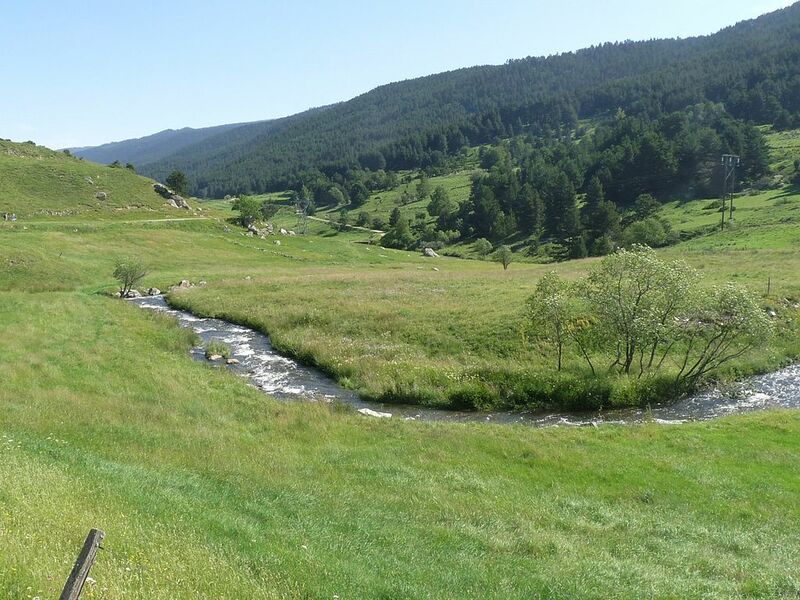 Our two villages are at the western end of the mountains called the Corbières, which stretch from the Mediterranean sea to this river Aude. Its source is in the Pyrenees, from there it runs through Quillan and Couiza to Carcassonne, where it turns eastwards to "throw itself", as the French say, into the Mediterranean Sea near Narbonne, at Les-Cabanes-de-Fleury. It seems to follow you everywhere, like a tail following a dog. The river is navigable along it's length and always has been, as far as we know. It was used to transport goods for hundreds if not thousands of years, until comparatively recently, and it still used by canoeists who have a club in Couiza. The source of the river Aude bears a marked similarity to the source of the River Sals at Sougraine near Rennes-les-Bains. The Sals joins the Aude after 17 km. 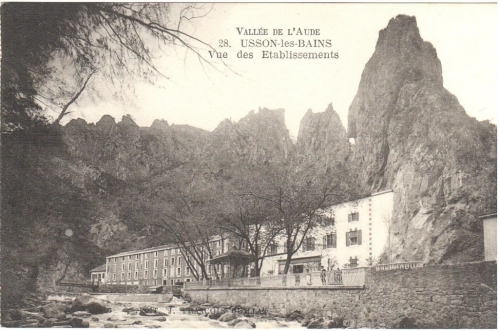 The Aude has its source in the Massif of Carlit at the Lac de Matemale 2,185 metres high just below Les Angles, the ski station, itself a little to the north of the famous St. Louis. 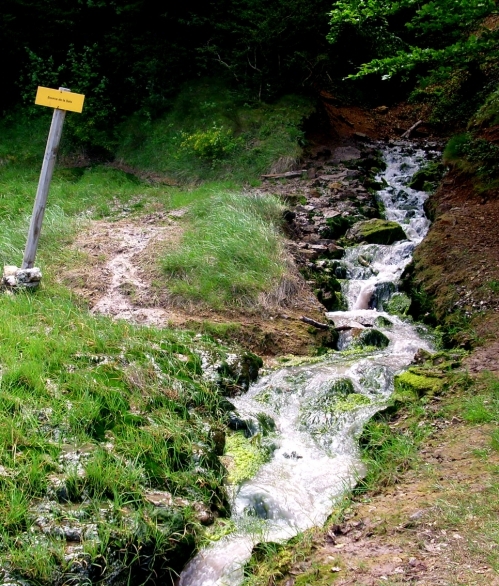 And like the Sals, the Aude never dries up, its source never stops flowing. 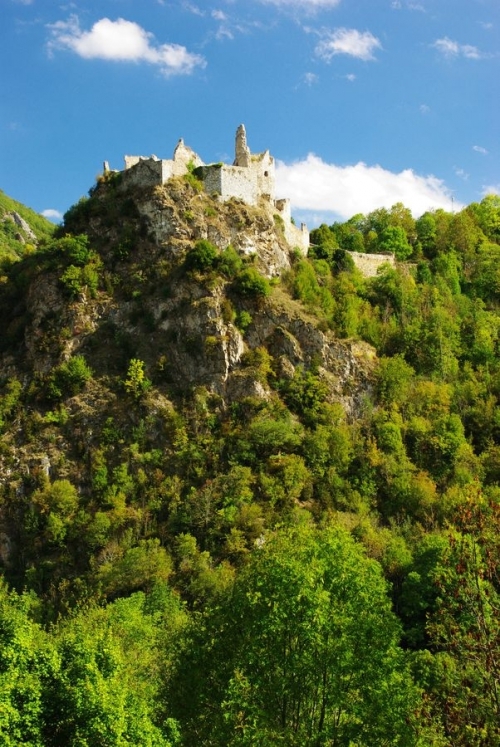 It crosses the border between Pyrennees-Orientales and Ariège near Puyvalador and then it reaches the foot of the castle of Usson, in the very south-east of the Ariège department. Here it is joined by the River Bruyante, which is wider, leading me to believe the Bruyante was the major river at one time, and that the Aude was not always called the Aude! The name Bruyante means "noisy" because it thunders through the gorges on rainy nights, waking the villagers. I have written a book about Usson castle, you can find it by clicking here. A friend of mine bought the castle and found the Treasure of the Cathars had been hidden there. 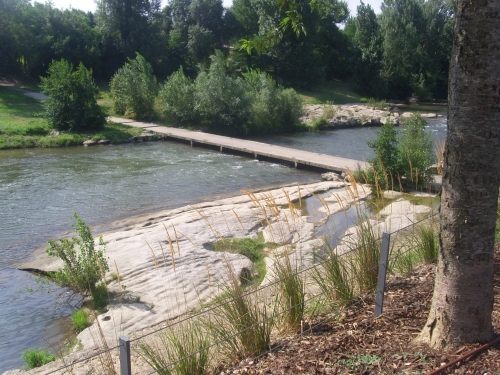 The river Aude crosses the Pays de Sault just south of the village of Le Clat, where Bérenger Saunière had his first parish, and then arrives at Axat which was Henri Boudet's home-town. It then rushes through the famous Defile de Pierre-Lys, a road clinging to the cliff-side which was only built in 1860, to Quillan, passingthe garden of Anneke Koremans at Belvianes. 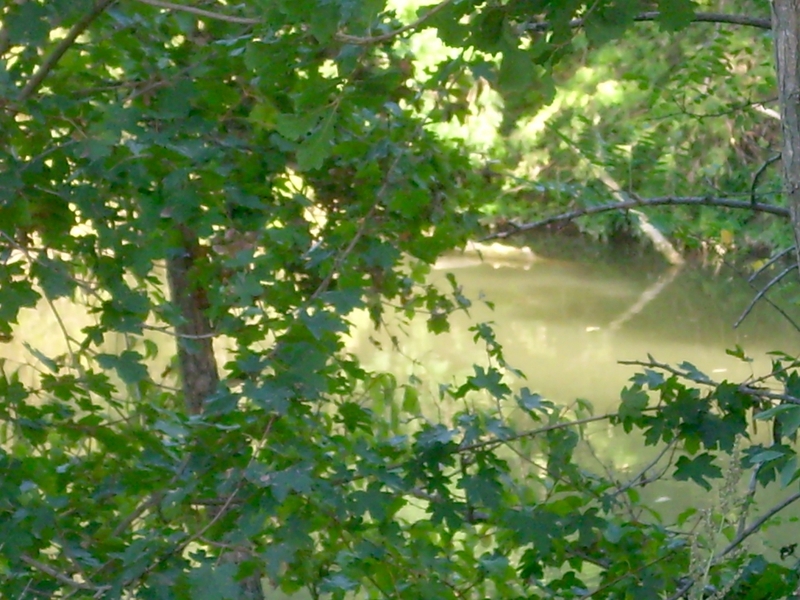 The the Aude starts to widen out into the grandaddy of rivers that we know so well. 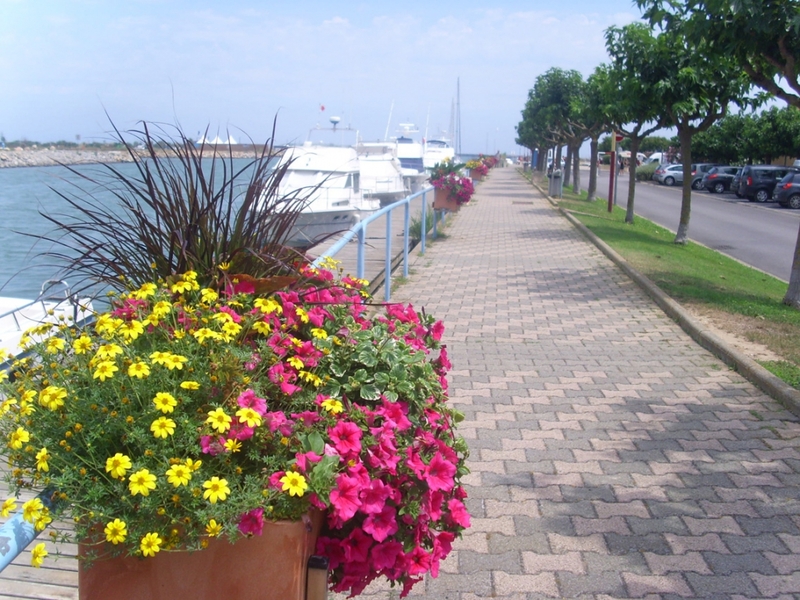 After that, Campagne-les-Bains, with its Templar town and its healing source, and Esperaza with its Sunday market, are both well-known to "the Rennies." 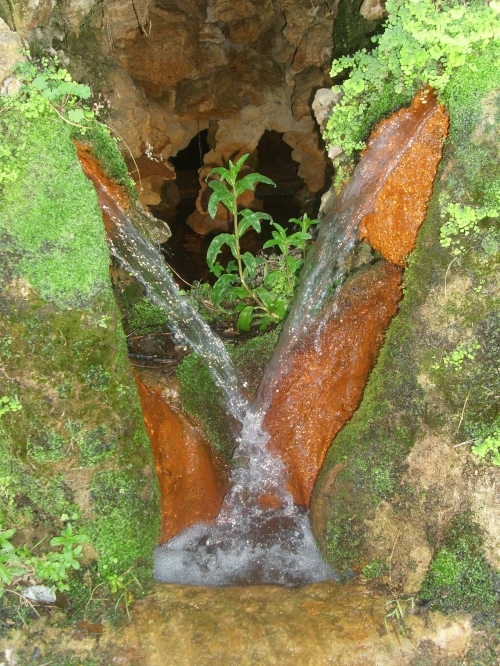 The source at Campagne and the Aude at Esperaza. 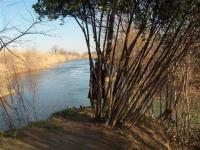 In its upper reaches the Aude has a nivo-pluvial regime, that is, its maximum flow occurs in spring when the snow melts. For the rest of the time it is mainly rainfed. At Carcassonne the average flow rate reaches 20.4 cubic metres per second. The flow at the estuary called Grau de Vendres where it meets the Mediterranean is around 50 cubic metres per second. These rates increase vastly, and are not always visible, when the river swells during the autumn storms, sometimes with disastrous results; people can be simply swept away. 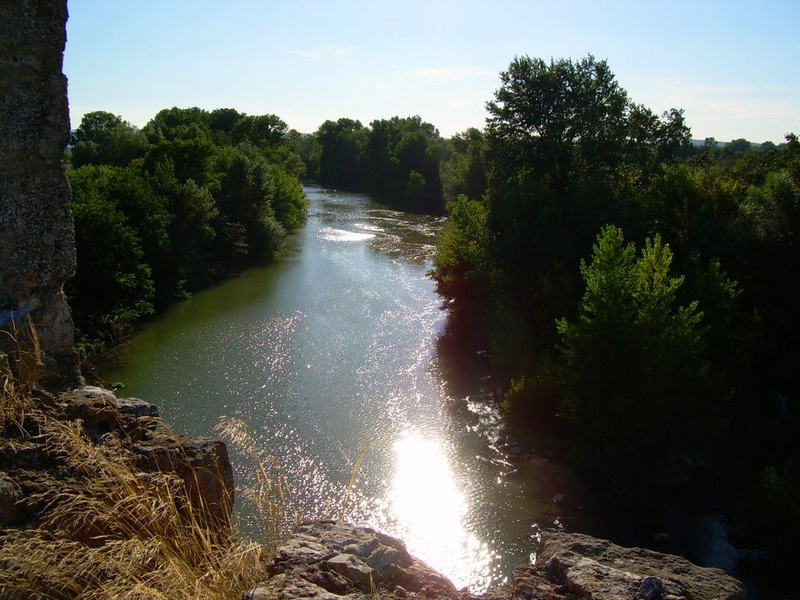 Even in ordinary conditions, never be tempted to swim in the Aude. 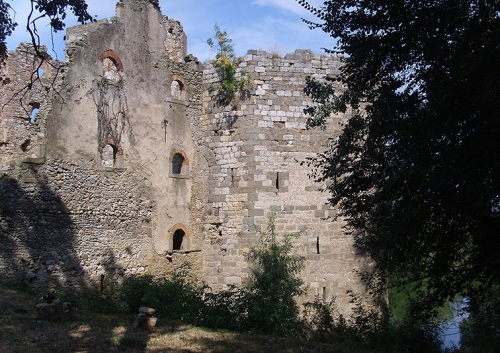 Some 5 kilometres further north, at Couiza, the village at the foot of the hill on which Rennes-le-Château stands, the Aude is joined by the River Sals from Rennes-les-Bains. This junction fascinates me, and ever since I moved here in September 2015 I like nothing more than walking beside the Aude or the Sals. Here's a film of the junction - click. Continuing northwards. 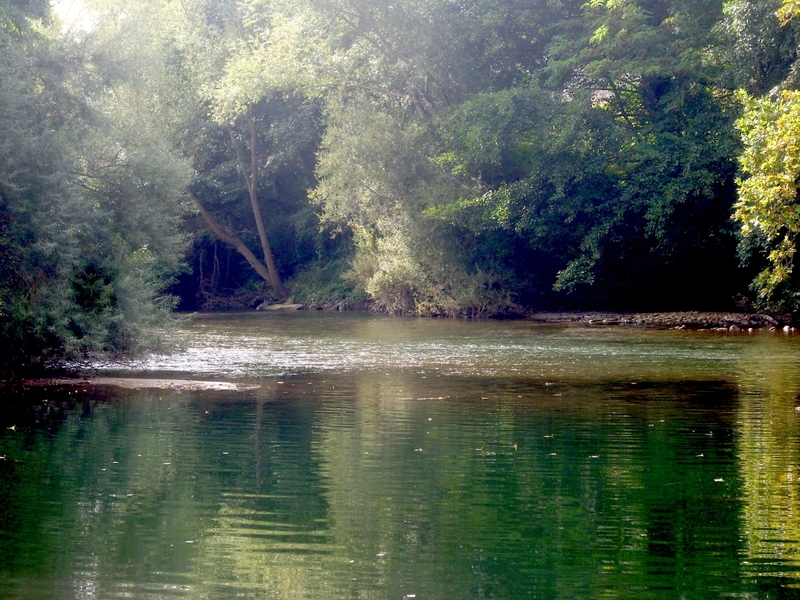 at Alet-les-Bains you can picnic on an island in the river, where once the Romans trod. Roman remains have been found here. See my Alet article here. Then the river finds its way through more gorges until it widens again at Limoux, and continues northwards to Carcassonne. The Roman road from Couiza through Alet to Carcassonne passed on the right bank of the river, not the left bank as the road does today, and continued straight to the oppidum of "Carcasso." 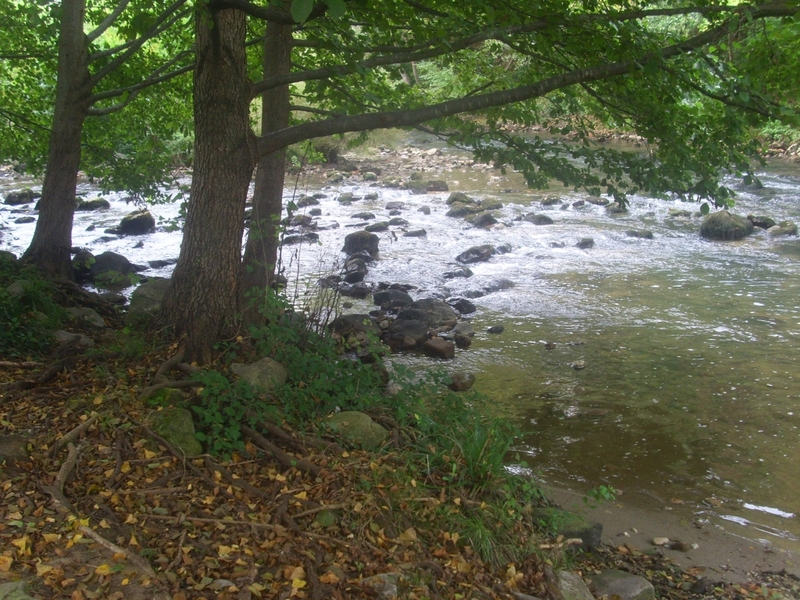 It's known that in Roman times this river was known as Atax, which means fast-flowing, and sometimes the Volques Tectosages, the Celtic people of our region, were known as Ataxians. At Carcassonne the Aude passes at the foot of the Cité, to which goes this secret footpath in the picture above, after which it was "captured" by another river to continue towards the east. 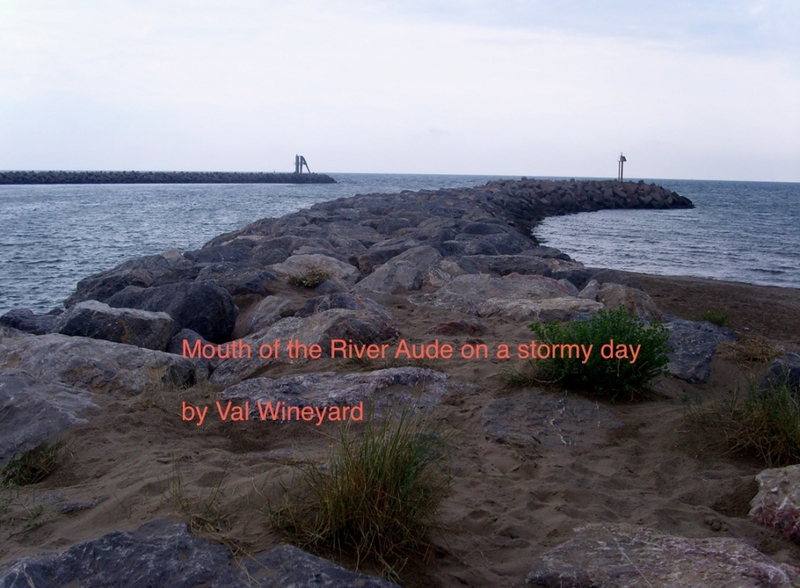 I think the Aude merely flowed into the Verdouble! It seems a series of rivers, in Aude, were decided to be the Aude when the departments were defined and named in the time of Napoléon. Many departments were named after rivers, such as Dordogne and our own nearby Ariège. At Carcassone the river flows between the "lower town," the Bastide of Saint Louis, and the City, the restored medieval village with its incredible history since Celtic times. It started life as a Tectosage oppidum. 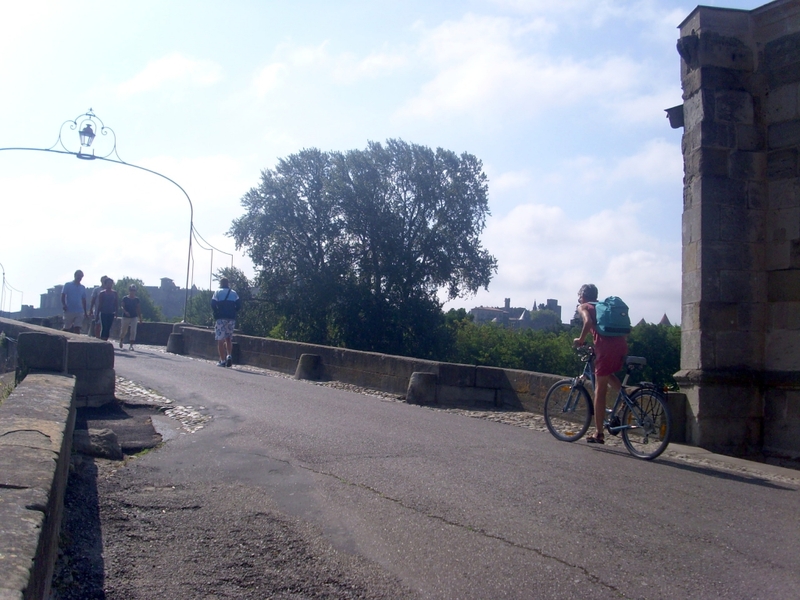 The bridge called the Pont Vieux used to be the old Roman road called the Via Aquitana, which went all the way from Narbonne, through Carcassonne, to Toulouse and then Bordeaux. You can walk across it to the city, but before you do, have a look in the little chapel whose foundations in the river are two or three storeys lower down by the water. (That will tell you something about high water.) 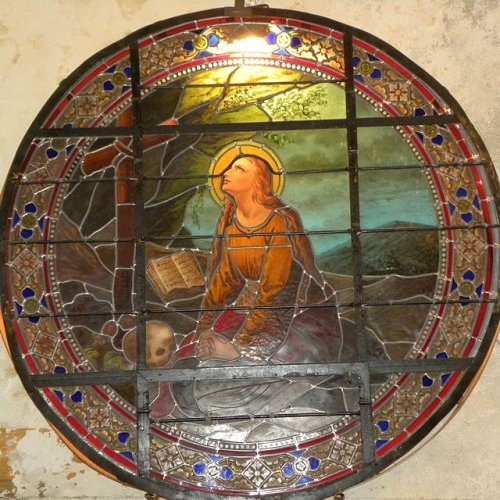 The chapel is dedicated to Notre Dame de Santé; I believe it was once a place where pre-Christian travellers stopped for refreshment and to say thanks to the Goddess of the river, before climbing up to the oppidum. 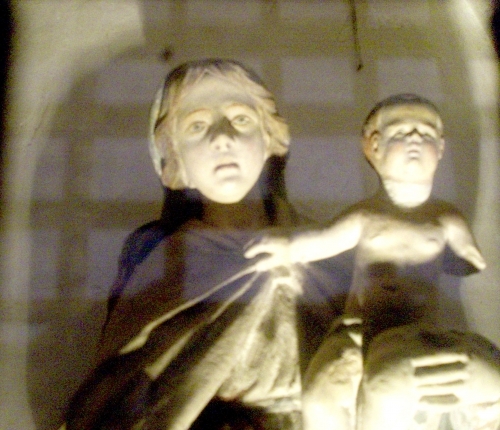 And now it houses a delightful young virgin and child. 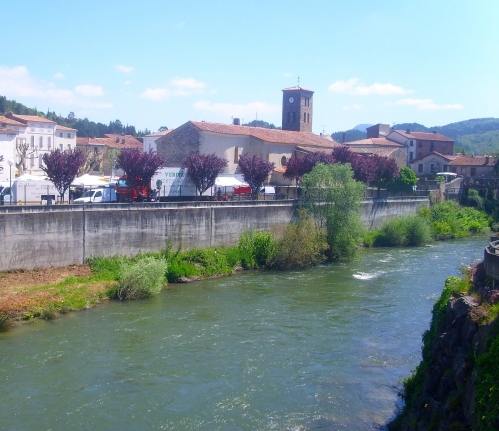 The Aude then continues through Argens and Roubia to pass between the Canal du Midi and the village where I used to live. This most interesting building was a flour mill from 1435 until 1923, but before that it was a medieval fortress built by archbishop Guifred of Narbonne to control the river traffic in 1059. The goods came down the river by boat and tolls were payable. Guifred had good reason to protect himself politically. He was a "bad lad" in conflict with the Viscounts of Narbonne and travelling around the region. It was during this time that he consecrated the church at Rennes-le-Château. Here you can see the change of architectural style quite easily. 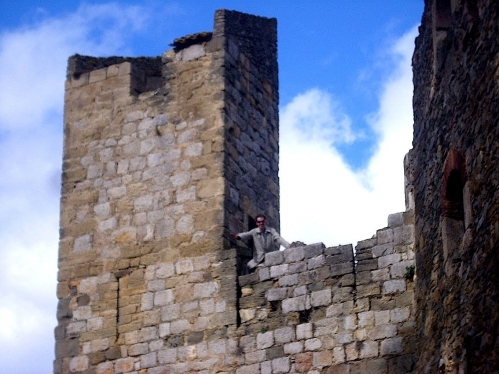 The 1059 fortress was built with large blocks of dressed stone, unlike the 15th century construction of the mill which was what architects call "vernacular." A mill-race was constructed behind the fortress to turn the wheels for the mill. 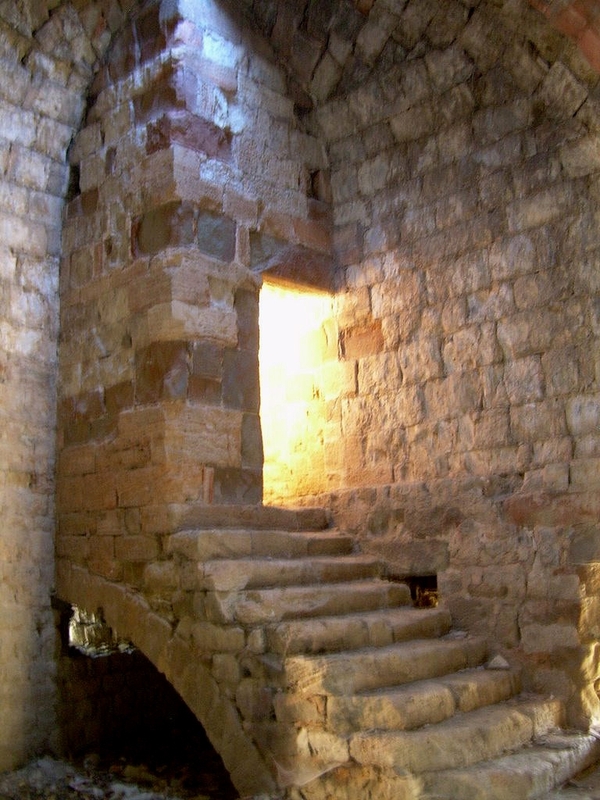 Here's the old tower you can climb, and the view of the river Aude from the top. 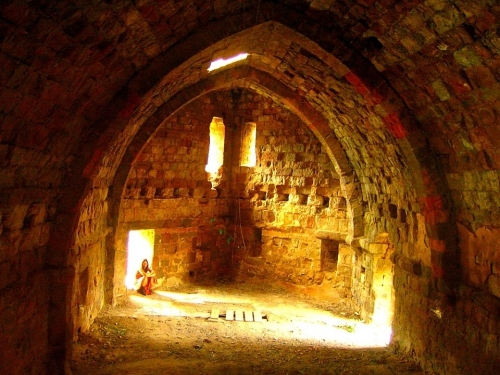 Inside the old fortress is a magnificent huge vaulted room, which was where Guifred's soldiers lived. My friends Richard and Scarlett from Montségur came one day and had great fun doing a photoshoot in this almost sacred setting. To read more about Canet - click here. Two kilometres further along is the village of Raissac where the Aude is joined by the gold-bearing Orbieu, that rises in the Corbières near Albières,not far from Rennes-les-Bains. 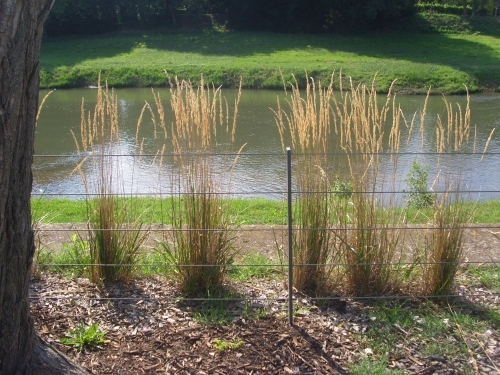 You know that the Celts considered river junctions sacred places? Just before this junction at Raissac I found an old flour-mill, NOT marked on any map! It had a stone jetty in front of it, proving that both the Aude and the Orbieu were used for transporting goods in the 18th and 19th centuries. But rivers were always used for this purpose. Aude on the left, green Orbieu on the right The mill, just metres before the junction. It's not easy to see, because of the dykes built against floods. There was a lot of flour-milling in this region until about two hundred years ago, flour was a valuable export that passed down the river and then joined the Canal de la Robine to continue to the coast for export. There were three mills on this flood plain of the Aude, within three miles of each other! The Aude continues to Sallèles d'Aude, at which point the canal crosses it. Well, it joins it for a while and then turns off to go through Narbonne. At the time this was a great feat of civil engineering as the canal had joined the old bed of the Aude which was left empty after the Aude changed its course. You can see much more about this by clicking here. It's of particular interest to those taking boating holidays. 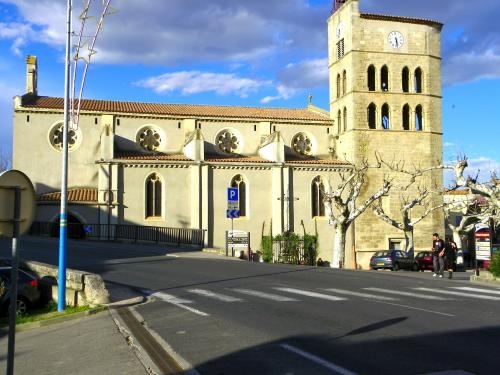 The bridge over the river Aude is just to the left of this magnificent church to Sainte Marie, right beside the river. Between Cuxac d'Aude and Coursan was where the river was "captured" when there was a gigantic storm out on the Mediterranean sea which swept inland and flooded the hinterland. 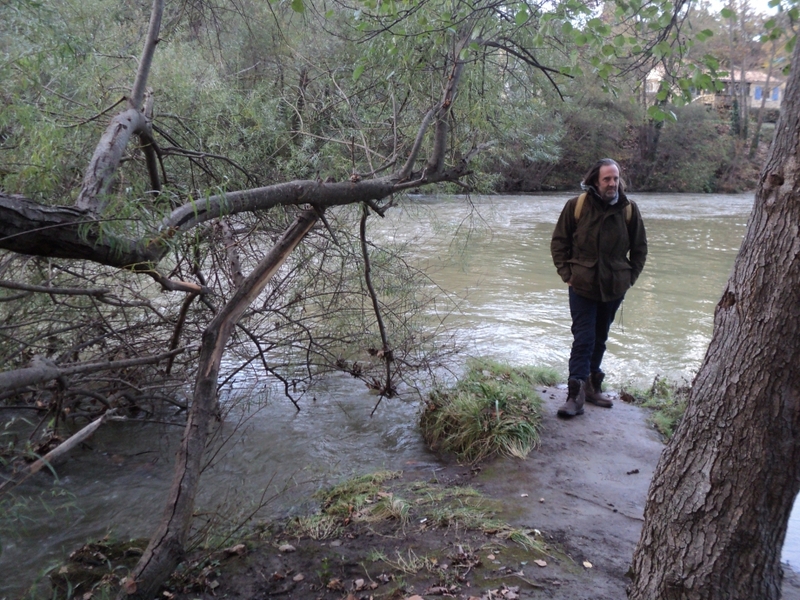 When the floods receded, the Aude was wandering between the muddy patches. The old bed to Narbonne gradually dried out and was used about 1700 as the bed of the Canal de la Robine, the link which takes the Canal du Midi to the sea at Port-La-Nouvelle, passing the foot of the Celtic oppidum called Montlaurès. 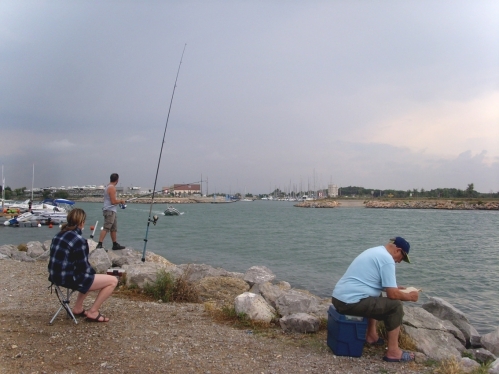 At this holiday village, still with a tradition of fishing, is the estuary of the river Aude, sometimes called the Grau de Vendres. Vendres is a nearby village that was once a Roman Temples to Venus. 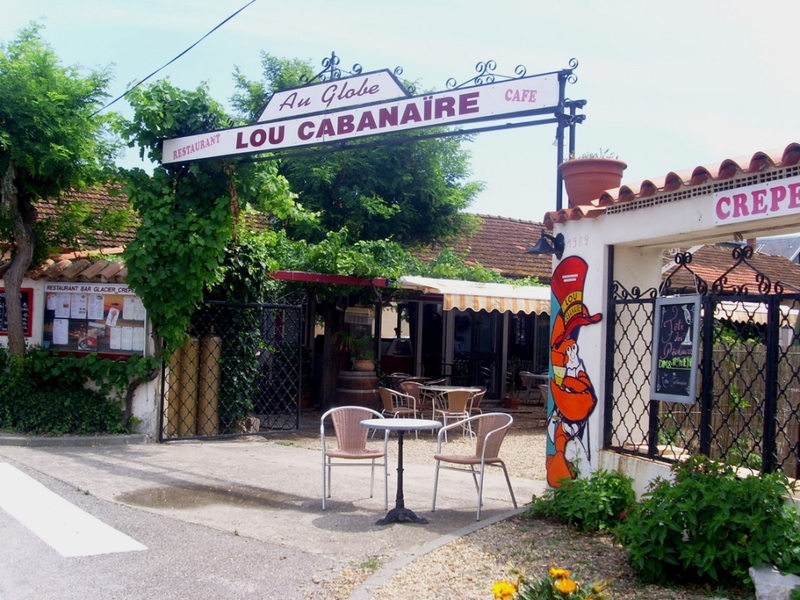 Cabanes is a delightful village to visit for a day out with lunch. I can recommend the Hôtel des Pins (after all, I first went there in 1982!!!!!) which can offer chef cuisine in its Restaurant l'Espadon, or cocktails, snacks and dancing in its Lou Cabanaire. Near the estuary is a market place with shops and cafés. You are now at the end of your journey, having passed all the places important to the Rennes-le-Château story, from the source of the Aude near Les Angles in the Pyrenees to its estuary. Two strongly constructed "moles" protect the village from storms at sea. For a film of the estuary that I made on a stormy day, click here. Lots of wind noise!